Our pressed mineral make-up kit contains everything you need to create a beautiful neutral make-up application. Perfect for those starting their careers in makeup artistry. 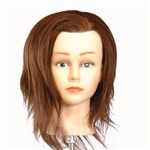 The Make-up Mannequin Tool Kit includes everything you need to practice make-up application and eye-brow shaping techniques under different culture climates. These soft skin-tone masks can be beneficial and economical for the makeup artist and esthetician. Not only can the make-up on the mask be removed easily, the same mask can be reused, but also provides a realistic human look as well. This unique feature enables you to save your desired creation, or simply erase everything you have done on the mask and create a new look with the same mask. These kits are used to sit for most State Boards for Makeup Artist Licenses. Skintight Clearing Cleanser - BBMGSK0200SX - Use for Head, Face, Neck & Body! - 3 oz Tube Clearing Cleanser is excellent for all skin types. It helps to clean, clear, smooth, soften and even skin tone without drying. Skin Tight Clearing Cleanser will leave your skin feeling clean, refreshed and residue-free. Directions: Wet face with warm water; gently massage all over head, face, neck or body, avoiding eye area. Rinse thoroughly and pat dry. Use twice a day for best results. Deluxe Mineral Makeup Kit - Light/Med - Over $1200 Retail Value! Try our new Alcohol Free, Skin Tight Ingrown Hair and Razor Bump Crème today! Skin Tight In-Grown Hair & Razor Bump Crème helps to moisturize, soften, and smooth the skin. Treats face, neck, underarm, bikini line, and legs. Alcohol free formula. *Not intended for use with Skin Tight Liquid Razor Bump Ointment* Basic Hollywood Makeup Kit - Dark, Over $425 Retail Value! This kit features our Dual Wet/Dry Pressed Mineral Foundations and our "Classic" eyeshadow and blush pallets. Please note: the "Classic" eyeshadow and blush pallets are non-mineral pallets. If you are interested in our mineral makeup collection, please check out our Basic Mineral Makeup Kit.